Photo Ease is a free Windows 8 Photo Editor. You can use it to add effects to you photos. Effects like Black and White, Solarized, Sepia, Inverted Colors, and many others are available here. Also, you get the ability to save the edited photos on your local storage as JPEG files. In Photo Ease, you also avail the option to share your edited photos with others over the Internet. 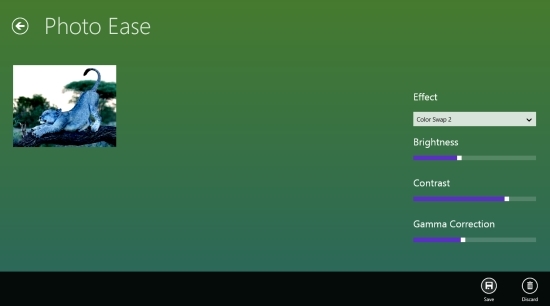 For that, you can use the Windows 8 Share Charm. 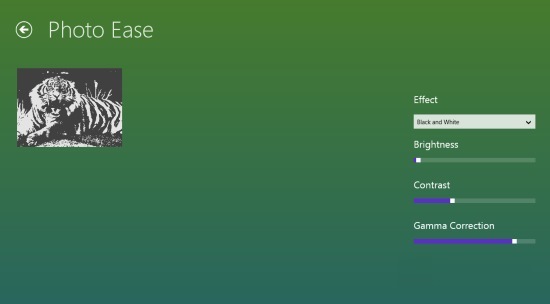 Photo Ease is freely available in the Photo category of the Windows Store. 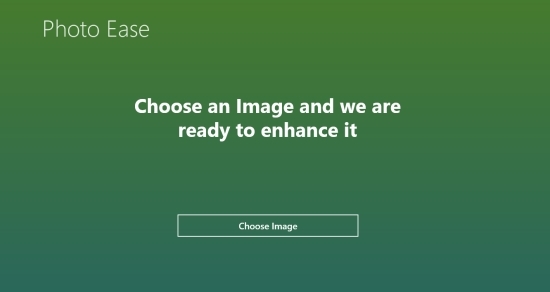 When you get into this Windows 8 Photo Editor after launching it, the option to upload the photo or image will appear at the main page. Now, as the image is opened in this free Windows 8 Photo Editor, all the options to edit the photo will appear on that page only. Here, you can add simple effects using the Effects option that is given with a drop- down. From among the available effects, there are Black and White, Grayscale, Solarized, Inverted colors, and others. 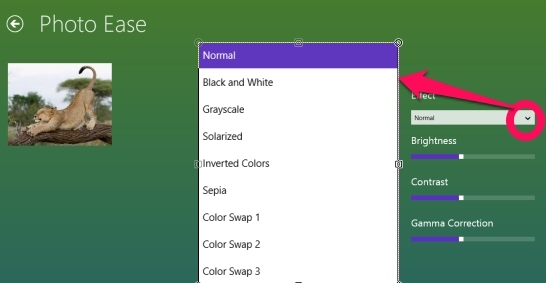 Apart from that, on this page of this Windows 8 Photo Editor, you also have the options to change the Brightness, Contrast, and Gamma Correction. You can use the bottom flyout of this Windows 8 Photo Editor, to save the edited Photos. For the bottom flyout, you can right click anywhere on the app when you have edited the photo. When you save using this option, your edited photos will be saved as JPEG file. In addition to all this, this app also has the capability to share the edited photos. 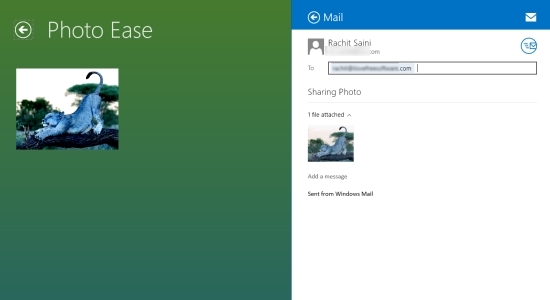 For that, you can use the Windows 8 Share Charm. In addition to all this, you can check these others apps reviewed by us earlier: Image Effect, Smilygram, FaceGoo, Crayola Photo. This photo editor is freely available in the Windows Store. Add nice effects to your pictures from your local storage, and to photos from your Image Capturing devices. You can save your edited photos. The photos would be saved as JPEG files. While using this Windows 8 Photo Editor, you even have the ability to share your edited photos over the Internet using the Windows 8 Share Charm. Finally, to conclude, I would like to add that this Windows 8 Photo Editor turns out to be useful if you are looking for basic editing. However, if you are looking forward to add good effects like morphing, make collages, adding texts or backgrounds to the pictures, this app turns out to be no good. For that, however, you can see the other apps that I mentioned earlier. Try it yourself to know better.